Colchester United winger Drey Wright has been ruled out for the rest of this season after being told that he must undergo knee surgery. The 20-year-old Londoner, who has made six appearances this season, scoring one goal, damaged his cruciate ligament on under-21 duty. 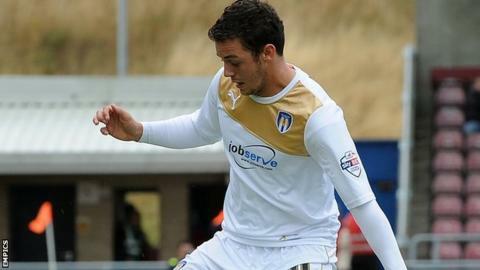 "I am incredibly disappointed for Drey," boss Tony Humes told BBC Essex. "He's worked very hard to get back in first-team contention this season and was a big part of our plans." Colchester currently stand 14th in League One, having lost just twice in nine matches since Tony Humes took over at the start of September. Wright has only been on the losing side once in the six games he has played, going down 4-2 to high-flying Preston in October. He has scored four times in 42 appearances, the majority of them as substitute, since making his debut in August 2012. Humes has confirmed that he will be now looking at the loan market, although he will have teenager Dion Sembie-Ferris back in contention in early November. "We will be looking to see how Dion will progress over this season," said Humes. "He will have an opportunity once he's back fit in a couple of weeks. We will also now have to look at an alternative option coming in and give us that support in wide areas."